Palladium coins are undoubtedly the rarest and most difficult to find of the major precious metals' issues. They share this in common with their sister metal platinum, though palladium is far less represented in the bullion coin arena, particularly where IRA-approved coins are concerned. Though it may be difficult for you to find good palladium coins either for your retirement or investment portfolios, we will help you to navigate the difficulties on this page. Here we will cover the five most important palladium bullion coins for either IRA retirement accounts (of which there are two approved to include in a Palladium IRA at the moment) or general investment portfolios. In order for palladium bullion coins to be allowed in a precious metals IRA, they must demonstrate extremely difficult minimum purity levels set by the Internal Revenue Service, and they alone have the rights to determine them. Such rigorous purity standards insist that any approved palladium bullion coin or bar must demonstrate at least .9995 fineness, which is 99.95 percent pure palladium. The IRS also demands that the palladium coins be struck at and by a foreign government mint which they approve personally. Lastly, the palladium in question has to be actual bullion. In other words, the coins struck in palladium may not be considered to be extremely rare, overly collectible, or have an unusually high premium above the global spot price of palladium which the world precious markets set every trading day. A few helpful guidelines: Two ways exist to include physical palladium bullion within your personal precious metals IRA. You can add the precious metal using either palladium coins and/or palladium bars. There are significant differences between bullion coins and bullion bars. In the end, whichever of the two you select (or you might choose some coins and some bars), it will mean that you have chosen rare and precious palladium over mass-printed paper currencies whose only value derives from your faith and trust in some government. The Canadian Maple Leaf lineup finally proved itself to be the most complete and versatile of all bullion metals series in the world when the Royal Canadian Mint became the only major governmental mint on the planet to issue its beloved series in palladium, thereby covering all four of the major precious metals with Maple Leafs. As the first and only official palladium offering out of the Winnipeg-based mint, these gems are also the globe's only legal tender palladium bullion coins which a recognized important government mint produced. The cutting-edged and forward-thinking Canadian mint has set the bullion standards once again with this coin. These Canadian Palladium Maple Leaf beauties were first struck in 2005 in a limited mintage of 40,000 coins. Over the following two years, they reduced production each year until they were down to merely 15,000 struck pieces in 2007. After 2007, the Royal Canadian Mint gave up the issue and stopped all production of palladium coins. They may have quit too soon, as the global consumer demand for such palladium bullion products rose dramatically following the worldwide financial crisis and Great Recession of 2007-2009. 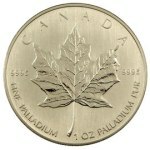 The RCM acknowledged this by starting up production again for 2009 to release a limited quantity of these Palladium Maple Leafs to match the high levels of demand. Because nearly all of the world's stockpile of palladium is located in the exclusive mines of Russia and South Africa, keeping a viable working store of palladium can be hard for any mint striving to consistently produce the coins. It helps to explain why so few palladium offerings exist and why their mintages are not so even as with the other three precious metals of gold, silver, and platinum coins. Without a doubt, the Palladium Maple Leafs prove to be the rarest of all the Canadian Maple Leaf series of coins. The second and last of the IRS-approved palladium coins which you may include in your Palladium IRA is the Russian Ballerina Palladium Coins. These issues represent both an investment choice as well as pieces with true historical and cultural appeal. They are a lasting legacy of the final years of the cold war era Communist empire of the Soviet Union. In the last days of the Soviets, they made a valiant effort to attempt to revive the failing Russian pride with these coins. Palladium Ballerinas were a means for the citizens of the Soviet Union to pay homage to the cultural beauty and power of the ballet, long a beloved tradition in Russian hearts. The Soviets selected palladium exactly because they had a massive domestic supply of the metal with which to work since over 40 percent of worldwide palladium production is found in Russia (although this is an estimate since the modern day Russian governments always attempt to keep their aggregate supply a state secret for some reason). The Moscow Mint struck them from 1989 through 1995. What makes them unique is that the Soviet Union superpower was gone by 1991, yet these coins endured under the auspices of only Russia for another four years while many other Soviet vestiges were completely abandoned or failed altogether. Once production was halted in 1995, demand rose as people realized they could own a tangible and precious last piece of a fallen world empire in these coins. Among the coins that do not quite make the list of IRA-approved bullion coins (but probably should) is the Australian Emu Palladium coin. The pieces tick off so many of the IRS' many mandates. They meet the demanding requirement of .9995 fine palladium purity. They were struck by a fully recognized, IRS-approved national facility in the Perth Mint of Western Australia, which produces all of the “land down under” legal tender and internationally coveted bullion coins. The coins which feature the biggest Australian native bird the Emu are also not considered to be commemorative. They were issued for several years through 1998 in fact. Where they fall down in the critical eyes of the Internal Revenue Service is with their extremely limited mintages of only 2,750 coins and similar restricted quantities during the other production years. Despite this ineligible determination from the IRS, these are fine coins for any other type of investment, collectible, or retirement account. Any official release from the Perth Mint is always a good choice, as this institution hails back to 1899, and it is well-respected for its stunningly high quality productions that merge the traditional craftsmanship of the mint with modern techniques including gilding and coloring. The Perth Mint is rightly considered to be an elite member of the few global mints whose Platinum, Silver, and Gold legal tender issues are all unquestionably trusted the world over. The Isle of Man has gained a justifiable and envied reputation within the world numismatic and investing community as the issuer of fantastic pieces in gold, silver, platinum, and even palladium. Their Angels are produced by the internationally known, largest private mint in Britain, the Pobjoy Mint, which focuses its efforts on uncirculated coins. With .999 fine palladium, they do not quite qualify for the IRS' demanding standards for palladium bullion coins in a precious metals IRA. Besides this, the gems were only struck in highly limited quantities of 1,000 coins this and most years. Still, if you are looking for an extremely rare and well-respected bullion coin in palladium which is backed by the government of the Isle of Man and features a stunning rendition of Michael the Archangel defeating the dragon, you can not go wrong with these striking and truly one of a kind pieces. Among the palladium coins of global interest which do not measure up to the IRS standards for inclusion in a Palladium IRA is the China Palladium Panda coin. In 1989, the People's Bank of China backed the production of 16 different Pandas. Ten were in gold, four in silver, one in platinum, and one in palladium. While this striking one ounce palladium coin is not the only year they issued palladium pandas, it is the only one which the central bank of China backed as legal tender. These had face values of 50 and 100 Yuan. The years which saw palladium pandas issued as a component in a collectible panda set were in 1989, in 2004, and in 2005. These legal tender palladium pandas were struck at 99.9 percent purity, meaning they did not measure up to the IRS' 99.95 percent palladium requirement. Their limited mintage of only 3,000 from the Shanghai mint meant that they were also considered to be too rare as well as from a non-IRS approved national mint (China is still not on the IRS approved national mint list). Why Invest in Palladium Coins? Bullion coins offer a higher liquidity in most cases versus their rival bullion bars since there are more coins produced and they are more beloved by investors and collectors. It helps a lot when you are trying to trade your bullion. Bullion coins are nearly always more collected than bullion bars. This numismatic appeal adds significant value in the mind of many investors. Besides this, the coins are more attractive, better crafted, and more eye-appealing with their creativity than the rival bullion bars. Bullion coins are almost all legal tender and come with the additional perk of a face value backstop provided by the country which issues them. This gives them greater appeal in times of financial distrust and global crisis.